Our Dual V6 Sump is manufactured from top quality high-density polyethylene (HDPE) this package pump system. The two V6 Pumps within the chamber are factory set to activate at different levels. One V6 pump being the primary and the secondary pump acting as a back-up. The Dual V6 is suitable for double and triple depth basements with a head height of over 3m. 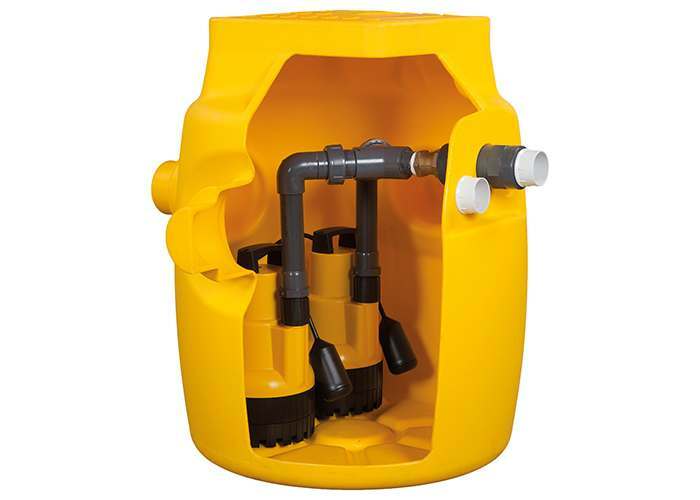 The Dual V6 Sump is suitable to collect ground water from a 150m2 basement and surface water from 12m2 of light well area. The Dual V6 package pump station has been specially designed to work in harmony with the delta cavity drainage system to collect ground water via a perimeter channel (Delta Drainage Channel) or modular drainage (129 Detail).